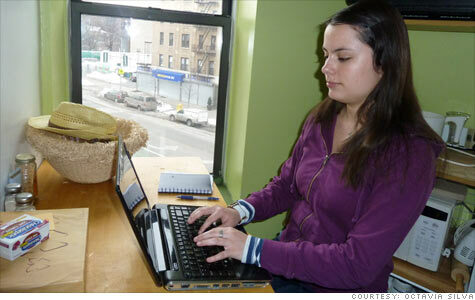 NEW YORK (CNNMoney) -- Each morning 26-year old Octavia Silva gets up, showers, puts on her business clothes, does her make up, and then starts her workday as an administrative assistant -- from a table in her living room. Silva answers phones and does other tasks for Surprise Industries, a company that plans oddball surprise presents, anything from a DJing class to flight school. She allows herself 30 minutes for lunch and ends her day promptly at 6 p.m.
"I give myself those limits so it would be like working in a real office," Silva said. She's one of a growing number of young professionals choosing to work from home as telecommuting opportunities have jumped nearly 400% in the past three years, according to job-search site FlexJobs.com. "[We are] receiving many more calls and inquiries from younger job seekers interested in telecommuting and flexible jobs," said FlexJobs CEO Sara Sutton Fell. In fact, she added, the number of young job seekers using FlexJobs to find these kinds of positions increased 181% during the past three years. "They really like it because it sits with the work/life balance that the younger generations really care about," said Melanie Holmes, a vice president at employment services firm Manpower. "My generation started out as workaholics, this generation is not like that." It also works for many entrepreneurs, who are staffing their firms virtually. Jack Goldberg, president of online marketing firm BirdDog Media, says most of his employees are between the ages of 24 and 28, and all of them work from home. In fact, there is no main office at all. Goldberg loves running a business out of his house -- especially greeting his daughter when she comes home from school -- and believes that although some employees get lonely home alone, most appreciate the freedom and flexibility. That describes Zach Welch, 25, who works entirely out of his one-bedroom apartment in Seattle. He's a program developer for BrainGlue, a Menlo Park, Calif.-based marketing agency focused on social networking. "My desk is in my bedroom so I roll out of bed and get going." Welch said. He loves the flexible schedule that comes with working from home, which allows him time to ski on the occasional weekday afternoon. But he also struggles with being alienated from his peers. "I am an extrovert by nature and I miss the social aspect," he admitted. And that, in general, can be a downside to these types of positions. "They don't have the depth of relationships," said Doug Arms, senior vice president of recruiting firm Adecco. "There's a certain value to face to face interaction." Arms believes that sharing an office can offer a career boost, as well as psychological one. He even contends that's what has helped him in his own professional experience. "There have been times when I've been outperformed by others, but the relationships I was able to develop propelled my career." Arms recommends making room for some face time with managers and other coworkers at least once a week to develop a personal connection.